When you make a room, floor level, or entire property, available as a vacation rental, you’re diving headfirst into the wild world of hospitality. There’s no getting around it: with vacation rentals, great reviews (or lack thereof) are often the difference between keeping your space booked year-round and watching it (and your wallet) collect dust. Keeping the great reviews rolling in isn’t necessarily easy, but it certainly doesn’t have to be overly difficult, either. Attention to detail and awareness of your guest’s needs are at the most basic level of building a profitable vacation rental business. To keep your space occupied consistently, go a step (or a few) further to provide an experience worth raving about online. Let’s face it: vacations rarely go as planned. No matter how perfect the weather looks when the itinerary is finalized, there’s almost always an unexpected rainy day or canceled tour. Sometimes it’s a case of jet lag that lingers a little longer than expected. When a day gets knocked off the agenda, it’s important that your rental space is there to save the day for your guests. Whether it’s an included Netflix subscription, video gaming systems and wide-range game assortment, a well-stocked bookshelf, board games, or a Keurig with a variety of beverage choices, these upgraded amenities are a big deal to your guests. It’s a huge load off to know they won’t have to go out of their way to entertain themselves, should a part of their plans fall through. They’ll be extremely grateful to you for making their entire vacation experience – even the unexpected parts – pleasurable and easy. Whether you’re present at the time of rental or not, you should be prepared to provide excellent guest service throughout any length of stay. If you’re renting out a room in your own home, make sure you’re friendly, helpful, and informative. Your guests are getting away to relax and enjoy some time apart from their daily lives. Ensuring you’re pleasant company without being constantly “in their business” makes a difference. If you’re renting an entire property and won’t be there for your guests’ stay, make sure you have systems in place to let them know you care about their level of comfort. This may include having services hired out to guarantee things are never out of stock, like toilet paper or basic pantry items. It could also be as simple as leaving a personalized letter explaining where your guests can find anything they may be looking for and wishing them a great stay. (Be sure to place it somewhere you know they will find it!) Consider including contact information for them if anything goes awry on the property during their vacation. The experience doesn’t have to end once your guests head home. After they check out, send them a friendly email thanking them again for their stay and ask if there was anything you could have done to make it better so you can improve for the next visitor. Invite them to leave a review for you via their chosen booking agency. It’s imperative to do this before they leave a review so the guest can air any concerns they had. This gives you an awesome opportunity to prevent bad reviews. 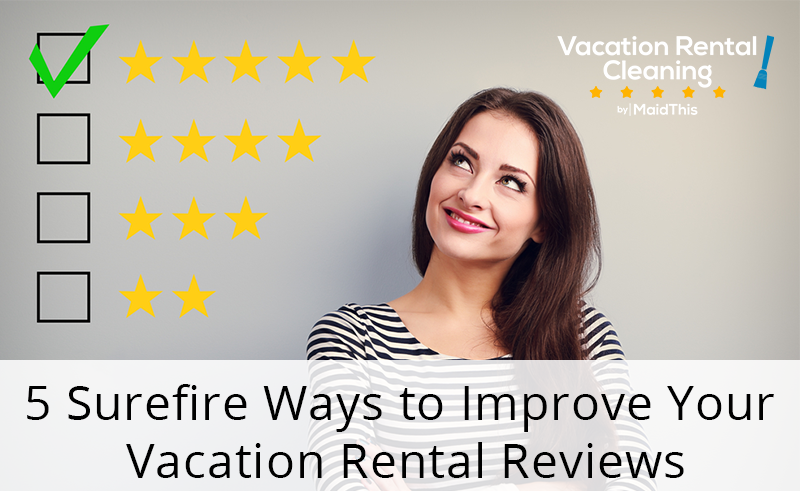 Being absolutely certain that you’ve done everything in your power to exceed each guest’s expectations is one of the best ways to improve your vacation rental reviews. There’s no substitute for great customer service, so make sure this is top-of-mind when it comes to your rental. Most often, people choose to rent a vacation space over a hotel because of the local vibe. People like to experience their vacation spot with more authenticity these days. Tourist traps are out; favorite local haunts are in. Be their one-stop guide to all the “best-kept secrets” of your area by providing them with a list of suggestions and a little bit about why you love them. Break it down into fun categories, like “Best Dive Bars,” “Most Delicious Pizza,” or “Satisfy that Sweet Tooth.” …You get the idea. Offering your unique insight on the city you know and love can help your guests experience their new surroundings in a totally unique way. That’s the kind of “above and beyond” treatment that will stick with your guests when they go to write their reviews. Plus, the memories your guests will create from your heartfelt suggestions are worth so much more than 5 stars and have the potential to create repeat renters. Need some help putting this together? Check out a couple of cool sites like Coral or Touch Stay, which helps you put together all kinds of info for your guests that they can access via an app on their smartphone. Think about the last time you stayed at a vacation home, or even a hotel, and walked into the room to find it looking like the last guests never left. The gross-out factor of arriving at a dirty rental is the kind of first impression that’s really hard to recover from. That’s why it’s so important to deep clean your rental between stays. Let’s face it, when people rent your space, they aren’t looking for something that feels decidedly “lived-in.” They are likely spending more than they would on a budget hotel room for a unique experience, sure – but they still have high standards for the cleanliness of that experience. Whether you personally head to the property to spend the day cleaning after your guests leave or hire a cleaning service to do the dirty work for you, a spotless scene for your next rental guests is imperative if you’re looking to rake in the good reviews. P.S. If you’re tired of scrubbing down your rental after every group of guests, we’ve got you covered. If you really want to stand out amongst your competitors, all it takes is doing something they aren’t. The secret? Get to know your guests. Make a point to have a genuine conversation with them before they arrive or shortly thereafter. Getting to know the people staying in your rental accomplishes a couple of important things in terms of providing top-notch hospitality: it allows you to tailor your suggestions to their interests and helps you understand where to concentrate your efforts for their stay. Taking a little extra time to understand why they are traveling and what brought them to you will also provide insight into what is already drawing people to your rental. It’s like a free case study on your reputation, so take advantage! All of these suggestions boil down to something really simple: be an amazing host. Care about your guests, care about their stay, and care enough about your reputation to go the extra mile. When you do these things, it won’t be the least bit surprising to watch your ratings rise – and your bookings and bank account along with them. Need help getting your vacation rental ready for your next guests? Set up a time to have one of our fully-vetted cleaners make your space sparkle and watch the rave reviews stack up.